If you’ve even been to the American Museum of Natural History (AMNH) here in Manhattan, you probably have a favorite wing or exhibit hall, because everybody does. Most people seem to favor the Dinosaurs, and while those halls are certainly worth visiting at least once, I think they are a little played out. 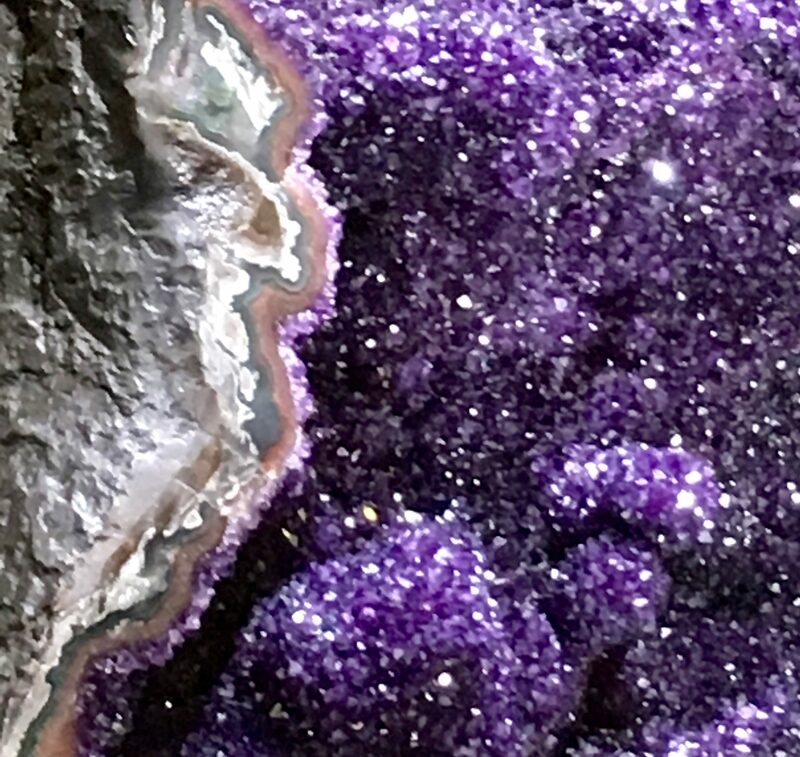 And while I do enjoy the Hall of Ocean Life, which is mind-blowing, my very favorite part of the museum are the Halls of Gems and Minerals, and I will recommend and rave about them to anyone who will listen. So, it was a pretty big deal to me when I received news from the AMNH that they will undertake a complete redesign of these very popular exhibit halls, currently known as the Morgan Memorial Hall of Gems and Harry Frank Guggenheim Hall of Minerals, transforming the 11,000-square-foot space into a gleaming showcase for their world-renowned collection! Wow! 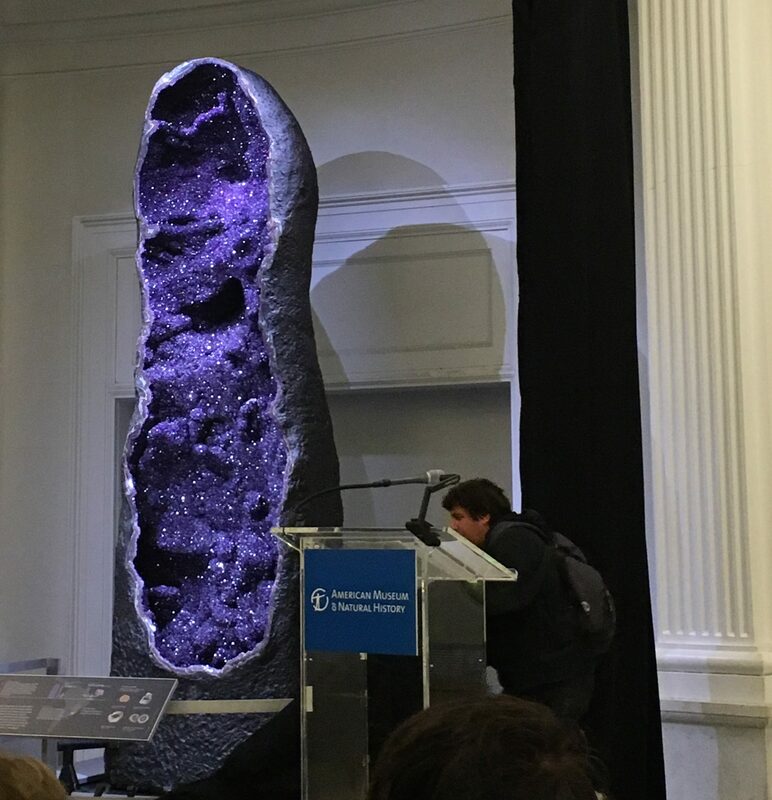 Not only that, but they also invited me to attend a media briefing event at the museum to witness the “Unveiling of a dazzling 12-foot-tall, 5-ton new acquisition!” Very exciting! 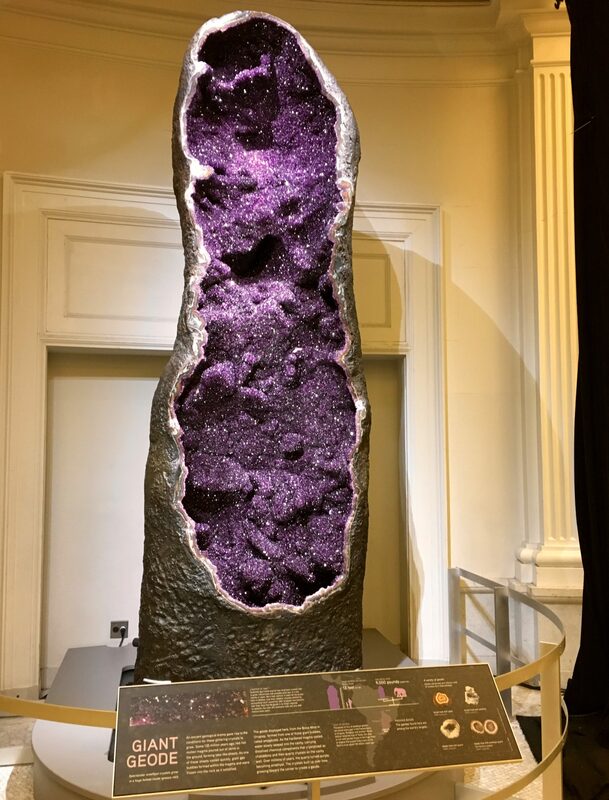 The new acquisitiion turned out to be a 9,000 pound Amethyst Geode mined in Uruguay, which will be on temporary view in the Museum’s Grand Gallery through the 2017 holiday season. 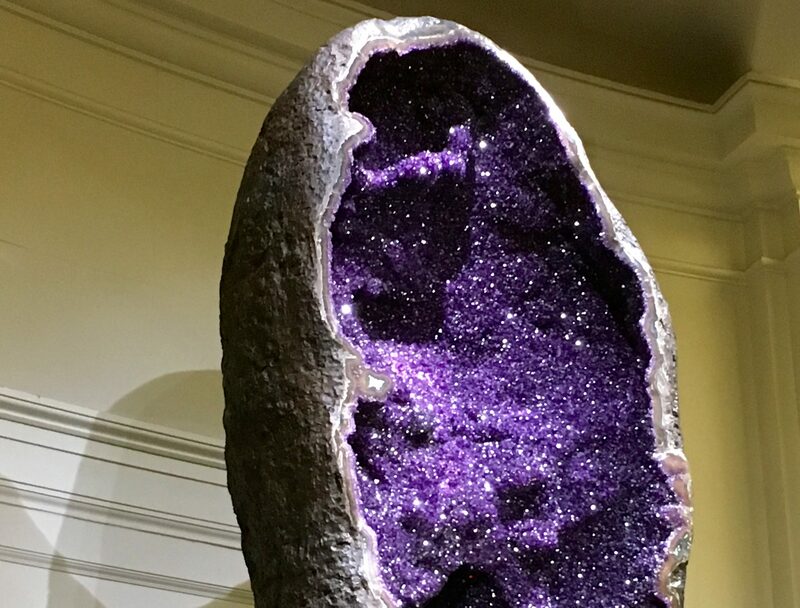 The geode, which will eventually be a centerpiece in the new halls, is among the largest amethyst geodes in the world. 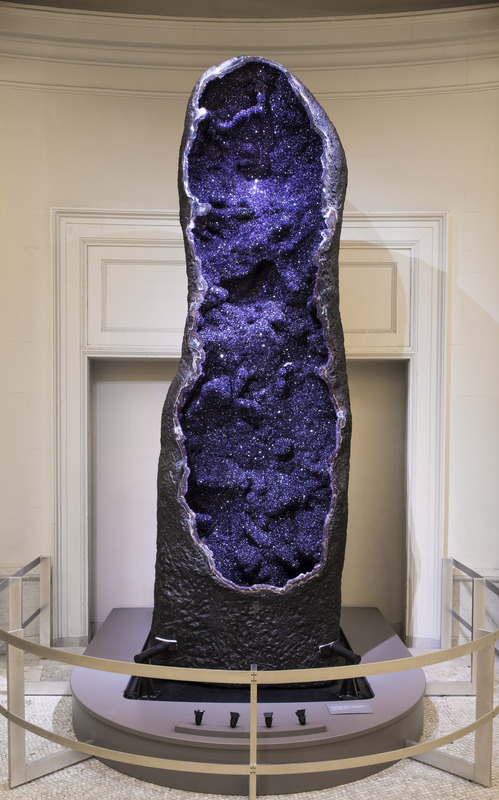 I heard someone from the museum say that the Geode was nicknamed Stan. I am not sure if they were kidding or serious, but it pleases me to think that this gigantic rock crystal, which happens to also be my birthstone, has a nickname, and to wonder how they came up with Stan. 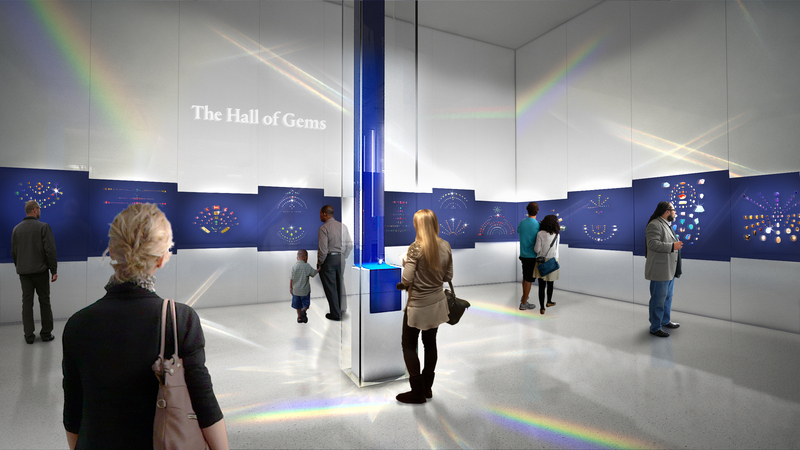 The renovation of the Halls of Gems and Minerals, which are being designed by Ralph Appelbaum Associates, is part of a series of physical and programmatic enhancements to historic parts of the institution, leading up to its 150th anniversary and the opening of the Richard Gilder Center for Science, Education, and Innovation, a major new facility that will house resources for education, exhibition, and research, and reveal modern science to visitors of all ages. 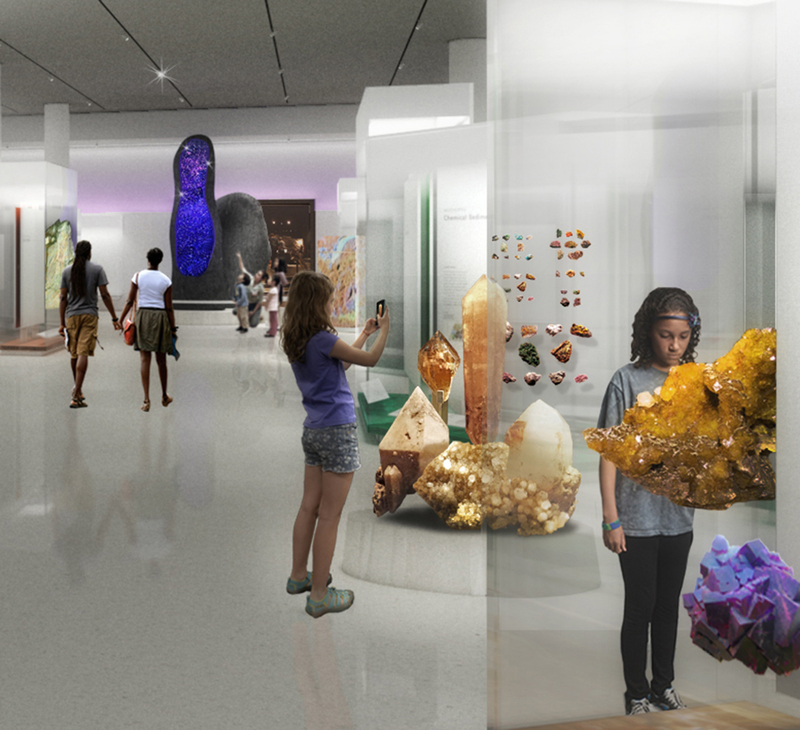 Here are a few renderings of how the new Halls will look (all renderings images are courtesy of the AMNH). Mineral Formation Zones Rendering. You Can See “Stan” at the Rear of The Hall. 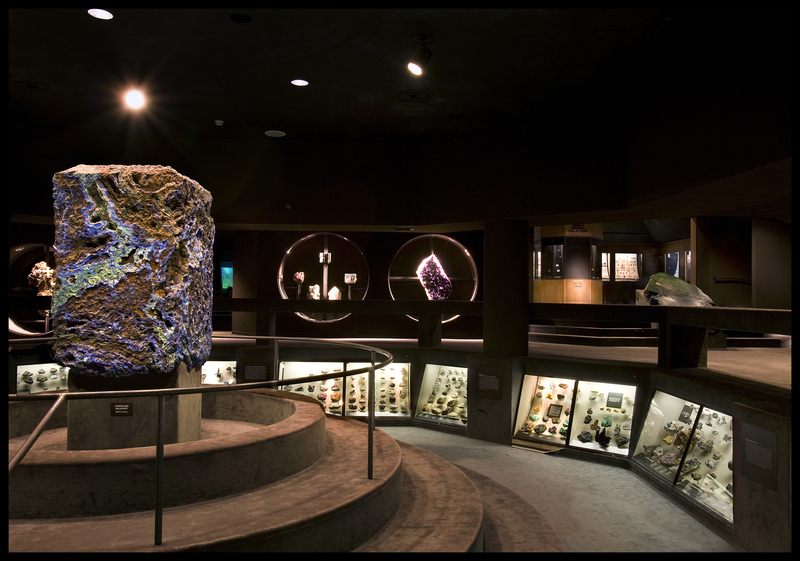 Museum President Ellen V. Futter offered trhe following statement, “Whether you’re talking about the spectacular 563-carat Star of India sapphire or the unique almandine (deep-violet-hued) Subway Garnet unearthed in New York City in 1885, the American Museum of Natural History is known for having one of the most spectacular and comprehensive collections of gems and minerals in the world.” Manhattan-based philanthropist couple Allison and Roberto Mignone are providing funding for the renovation, and as such the new hall will be named Mignone Halls of Gems and Minerals. 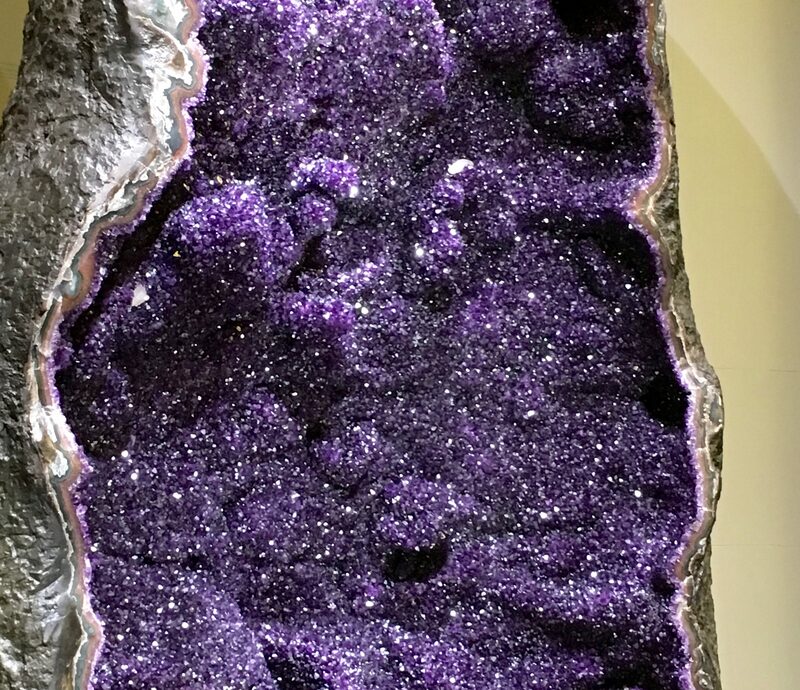 The new halls will include many fun surprises, including a fluorescence and phosphorescence gallery, featuring a massive panel of fluorescent rock from the Sterling Hill Mining Museum in Ogdensburg, New Jersey, that glows in shades of orange and green under ultraviolet light! While the Halls of Gems and Minerals previously formed a cul-de-sac, they will soon feature a dramatic link, via a stunning Crystalline Pass on the north side of the halls, to the Richard Gilder Center for Science, Education, and Innovation, the new facility designed by Studio Gang Architects. Construction on the new Mignone Halls of Gems of Minerals has now begun, with the closure of the current halls on October 26th, 2017. 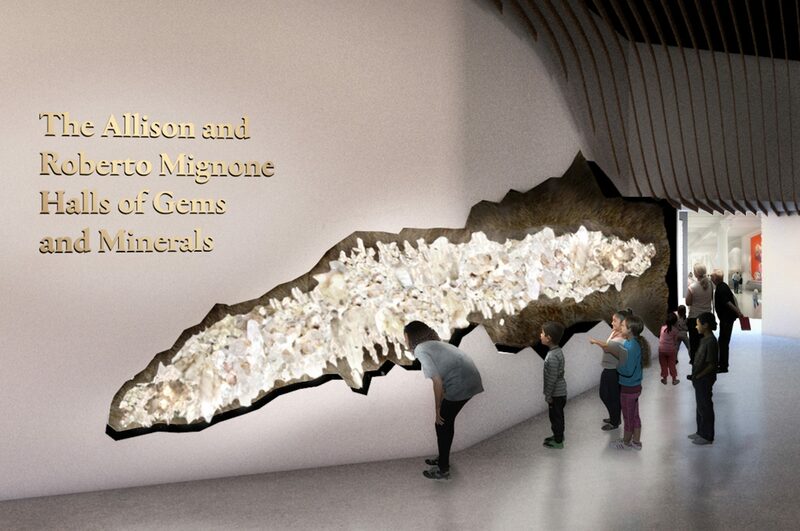 The Mignone Halls of Gems and Minerals are expected to open in 2019, as part of the Museum’s 150th anniversary celebration.